People often find certain points around their homes get weak Wi-Fi signals. This makes them try to find better ways to boost their Wi-Fi range. 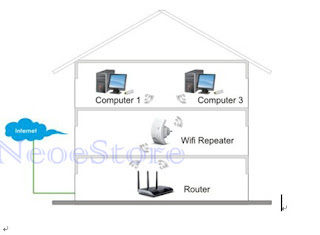 However, they are often confused which device to buy Wi-Fi extender, booster or repeater? Most of these terms are often used carelessly and many manufactures either call their devices repeaters, extenders or boosters interchangeably. Let us learn about the difference between Wi-Fi repeater, extender and booster or if they all mean the same from the following article. What is a Wi-Fi Repeater? Suppose you have a home or office wireless network, MyNetwork01. You find your Wi-Fi signal does not reach certain points in the house or office. Now, you bring home a Wi-Fi repeater. It acts as an Access Point and boosts the signal to every corner of your network. A repeater is similar to your wireless router, wherein, the secondary one picks up the signals from the primary router and transmits it. Thus, you can receive a stable Wi-Fi network in areas where it was weak. Now, let us take the example of our MyNetwork01. When you use an extender, it helps in expanding the range of the existing wireless router. This means it captures the switch signal or Wi-Fi router signal and retransmits it. However, this retransmission occurs under a new name MyNetwork02. So, if you are in the area of poor network, then you need to connect to MyNetwork02 and not MyNetwork01. And if other devices such as your Wi-Fi printer is connected to MyNetwork01, then it won’t be much of a help to a laptop active on MyNetwork02. A Wi-Fi booster is useful for people who find many spots in their homes where the wireless signal does not reach. The booster connects with your current wireless network and bounces stronger signals around the area. A booster is very useful for smartphone or tablet users to get better Wi-Fi signals from their existing hotspot. This was something about the difference between Wi-Fi repeater, extender and booster.